Taking Billykirk's utilitarian, "doctor bag" style No. 165 Medium Carryall and making it even better is no easy task. Each bag is already meticulously crafted by hand in New York by a set of highly skilled craftsman, along with Chris and Kirk Bray themselves. 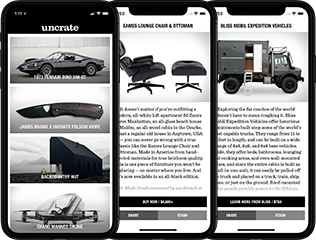 To make the Billykirk x Uncrate edition of the No. 165, we started with the 20-ounce waxed canvas (black of course) and added our own American Bison hide for the handles, trim, and bottom reinforcement. From there, a Ranger Tan nylon interior was added to ensure items inside are easy to locate at a glance. A hinged top ensures the bag stays closed when it's meant to be, even if the straps and buckles aren't secured. The hand-stitched bag is just large enough for overnight endeavors while remaining appropriately sized for everyday carry as needed. A detachable shoulder strap makes longer carries easier, and when combined with the similarity outfitted Billykirk x Uncrate Dopp kit and Commuter Tote, you'll be set to haul enough for a long weekend. Height: 11" / Width: 16" / Depth: 6.5" / Handle Drop: 6.5"